by Chris Woodford. Last updated: October 17, 2018. Do you ever wake in the middle of the night wondering whether you need to get up yet? By the time you've scrabbled around for the alarm clock, chances are you've knocked over a glass of water, swept the contents of your beside table to the floor, pulled a muscle stretching too far, and woken up the rest of your household as well. Unless, of course, you have an electronic alarm clock with a VFD. Typically colored green, these digital displays are bright and clear enough to see in darkness (or full sunlight) without straying an inch from your pillow. Although VFDs have been widely replaced by LCDs in applications such as pocket calculators and handheld games, they're still used in microwave ovens, audio equipment, and car dashboard displays. Ever wondered how they work? Let's take a closer look! 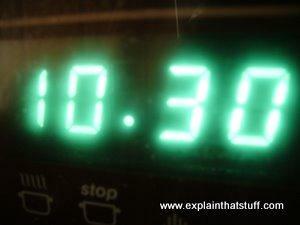 Photo: A VFD displays the time on this electric stove. VFDs are widely used on stoves and microwaves, partly because they're easy to read from a distance, but also because they work at much higher temperatures than LCDs (typically up to at least 85°C or 185°F)—so there's less chance of the stove's heat affecting them. A few decades ago, electrical appliances were blissfully simple: you could switch them on and off—and that was about it. Now things are more complex and even relatively simple things like clothes washing machines, vacuum cleaners, telephones, and radios have digital displays that tell you what they're doing. Some can show numbers, some display numbers and letters, and others can show animated pictures. Photo: It takes seven individually controllable segments to make each digit of a numeric display like this. LEDs: These incorporate brightly lit segments that work in the same way as the little light-emitting diodes (LEDs) used on instrument panels. Typically, LED displays show only numbers (digits), each one made up of seven illuminated bars (or segments). They work equally well in darkness or light, but consume relatively large amounts of power. LCDs: More versatile than LEDs and also more compact, LCDs can show numbers, letters, words, or pretty much anything else. They're used in everything from cellphones and laptops to pocket calculators and LCD televisions. Although they use relatively little power, they need a backlight (a light shining from behind them from the back of the display out through the front) so you can see them properly in low light levels. VFDs: Combine the advantages of LEDs and LCDs. They're as bright as LEDs but easier to read, and they can be used to display numbers, words, or letters. They're easy to read in darkness or light. If you know how an old-style cathode-ray tube (CRT) television works, understanding a VFD is simple. In a TV like this, there's a hot piece of metal called the cathode whose job is to fire electrons down a glass tube to the screen at the front where the picture is formed. The screen is coated with chemicals called phosphors that glow (or fluoresce) when the electrons crash into them. By steering and focusing the electron beam using magnets and a metal grid with holes in it, we can paint an ever-changing pattern of glowing dots on the screen—and that makes the moving picture you see when you watch TV. There's a heated filament (the negatively charged cathode) made from tungsten metal whose job is to produce electrons. It's the red bar in our diagram. Each segment of the display (which is a positively charged anode) is coated with phosphor, like the screen of a TV. These phosphor-coated segments glow with light (often a ghostly green color) when electrons hit them. In between the cathode and the anode there's a thin mesh of metal called the grid that can be switched on or off, controlling the flow of electrons from the cathode to the anode. Here (left/below) is an illustration of a typical, practical VFD using similar color coding. The cathode (red) consists of two very fine wires running down the center. 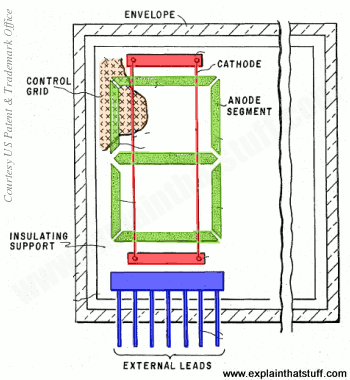 The seven anode segments (shown in green) are coated with fluorescent material and positioned beneath the cathode wires, with seven external leads to control them (shown in blue at the bottom). You can see a section of the grid at top left (orange). The cross-hatched "envelope" around the edge is the vacuum compartment in which the whole thing is sealed, typically made from glass because you have to be able to see the segments lighting up! 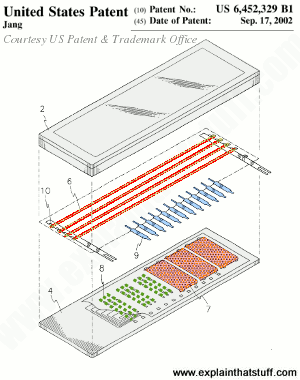 The second artwork (right/below) is an exploded view showing the three-dimensional arrangement of the components in a typical VFD, again with similar color coding. There's a glass top panel and a glass base (gray). The anode electrodes (green) are at the bottom, with the grids (orange) just above them. On top of that are rows of cathode filaments (red). Wire connections (blue) pass current to the anodes and grids. The whole thing is vacuum sealed. Artwork: 1) A typical, generic, triode-style VFD (illustrated as part of the prior art referred to in US Patent #4,004,186: Vacuum fluorescent display having a grid plate coplanar with the anode by Ernest Gerald Bylander, Texas Instruments Inc., January 18, 1977.) Artwork courtesy of US Patent and Trademark Office. Artwork: 2) An exploded view of a typical VFD (part of the prior art referred to in US Patent #6,452,329: Vacuum fluorescent display for minimizing non-use area by Chul-Hyun Jang,	Samsung Sdi Co., Ltd., Sepember 17, 2002.) Artwork courtesy of US Patent and Trademark Office. How do you control a VFD? Typical VFDs show several digits or letters—and maybe preformed words too (like Manual, Auto, AM, PM, Defrost, or whatever). Apart from the display itself, VFDs also need a way of being "driven" (controlled electronically from whatever circuit they're attached to)—and there are two ways of doing this. One is to use separate pin connections to each segment of the display and a single grid. This method is called static drive. Another method uses lots of different grids (one for each segment) that are turned on and off in rapid succession (typically over 100 times a second) by a microprocessor (single-chip computer). Each segment of the display that appears to be permanently turned on is actually flashing on and off very quickly (too quick for our eyes to notice) in sequence. This approach is called multiplexing (or dynamic drive) and has the advantage of needing simpler drive circuitry (fewer chips and pin connections) than static drive. 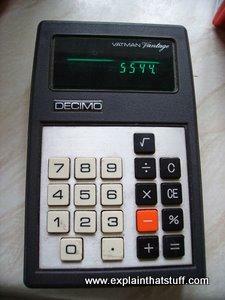 Photo: In the 1970s, VFDs were widely used in pocket calculators like this before low-power LCDs started to replace them. Invented by Japanese company Noritake in the late 1960s, VFDs became popular in the mid-1970s as a more versatile and attractive alternative to LEDs (which typically consumed more power). In their turn, VFDs were superseded by LCDs, which were more compact, cheaper to make, more versatile (capable of displaying complex, high-resolution color pictures of absolutely anything—which neither LEDs nor VFDs can manage), and used even less power. But VFDs remain a popular choice for simple, robust displays in electronic instruments and appliances that need to work in a wide range of lighting or temperature conditions. According to Noritake, VFDs can be far superior to LEDs and LCDs in certain applications: they're easier to see in very bright light and darkness, and they can be dimmed very easily for use at night (simply by reducing the amount of time for which the segments are switched on in a multiplexed display); they often look more attractive than LCD displays; they can be seen from further away and from a wide range of angles (a notorious problem with LCDs, which darken and change color when you look at them from an angle); and they work at a wider range of temperatures (an important factor in low-temperature, outdoor equipment and for high-temperature appliances such as microwave ovens and electric stoves). The disadvantages of VFDs? Unlike an LCD, they can display only predefined combinations of letters, numbers, or words. Compared to LCDs, they have relatively high power consumption (so they're less suitable for battery-powered gadgets such as pocket calculators and digital watches). Other problems include some segments of a VFD display gradually becoming brighter or dimmer than others (caused by the phosphors glowing less brightly as they get older) and flickering (a problem caused by using the wrong frequency for multiplexing). Handbook of Display Technology by Joseph A. Castellano. Gulf Professional Publishing, 1992. Chapter 7 is a detailed look at VFDs, including detailed diagrams of their construction and examples of where they are used. Vacuum Electronics: Components and Devices by Joseph A. Eichmeier and Manfred Thumm (eds). Springer, 2008. Chapter 2 (Vacuum displays) looks at the history of VFDs, how they work, typical applications, and future prospects. Phosphor Handbook by William M. Yen et al. CRC Press, 2006. Chapter 8 "Phosphors for vacuum fluorescent displays and field emission displays" (p667) includes a simple illustrated explanation of how VFDs work and technical details of the phosphors they use. How To Hack Vacuum Fluorescent Displays by Dave of EEVblog. A quick look at the theory, followed by some hands-on experimenting (the lab-bench bit starts at 9:17 into the video). Noritake Itron: Some interesting videos of vintage Noritake displays posted on YouTube by an enthusiast. US Patent #3,508,101: Character indicating electron tube by Mikiharu Tanji, Ise Electronics, April 21, 1970. US Patent #4,004,186: Vacuum fluorescent display having a grid plate coplanar with the anode by Ernest Gerald Bylander, Texas Instruments Inc., January 18, 1977. US Patent #4,004,186: Vacuum fluorescent display for minimizing non-use area by Chul-Hyun Jang,	Samsung Sdi Co., Ltd., Sepember 17, 2002.